We share below the causes, symptoms, and treatment for your top of the foot pain from running so that you can back out and running again. Most avid runners experience top of foot pain from running at some time or another, finding the cause is an essential part of getting healthy quickly and safely. The good news is the most common cause of top of foot pain, in competitive runners, is wearing improper footwear or lacing the shoes tightly or incorrectly. First, it is important to rule out the most serious injuries associated with this pain. What are the Most Common Foot Injuries from Running? 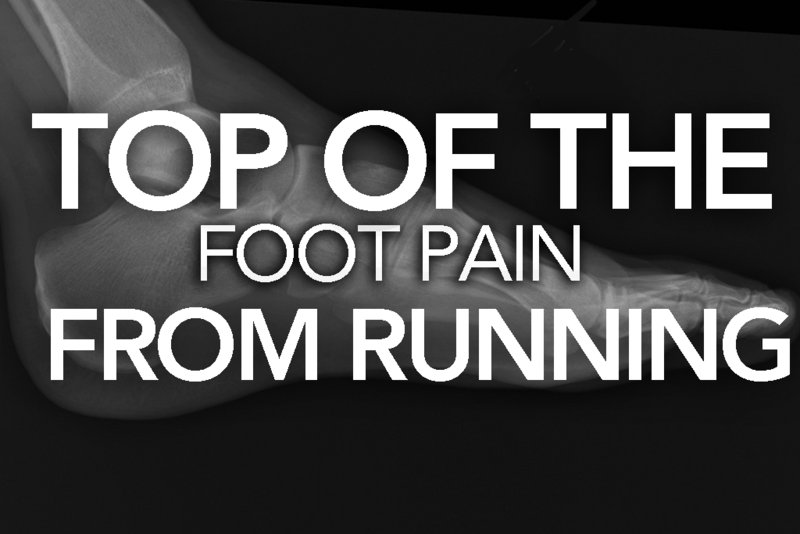 The most common injuries, in runners experiencing top of foot pain, are the following. Unfortunately, both require a minimum of six to eight weeks rests from logging more miles on the track, pavement, treadmill, or trails. Dr. Perez from Alamo Foot & Ankle Care details some of the other reasons why you may have top of the foot pain. What is a Foot Stress Fracture? A stress fracture is a small break in one of the bones on top of the foot. Stress fractures occur when the foot is repeatedly over-used, placing too much force on the bones in the foot. There is a greater risk of developing of a stress fracture if your training is increased in intensity, duration or frequency too quickly. A stress fracture can only be confirmed by getting an x-ray from your physician. Pain: A stress fracture starts off with mild pain and will gradually worsen over time. The pain may come on only while running. As the injury worsens the pain on top of the foot will come on quicker and will last longer. In an acute stress fracture, the pain will affect everyday activities like walking and standing. Swelling: The swelling may be mild to severe. Tenderness: You may or may not feel tender on top of where the stress fracture is located. Rest: It is important that you stop all ﻿﻿running, except pool running, if you have symptoms of a stress fracture or diagnosed with one. It takes most runners six to eight weeks to heal from a stress fracture. Do not return to your training until you can run pain-free. Ice: Apply ice compression for 10-15 minutes daily, every two hours. I like the NatraCure Hot/Cold Therapy Wrap. It's designed to fit around your foot with compression. It's hot or cold options truly help reduce swelling. Elevation: When you elevate the foot above the level of the heart, you will help both swelling and throbbing of the foot. Braces: In severe stress fractures, a physician may advise a brace or decide to cast your foot. Medication: Your doctor may prescribe a drug that promotes healing and reduces pain more effectively than some over-the-counter drugs. What is Tendonitis For Runners? Top of foot tendonitis (extensor tendonitis) is inflammation or irritation of the tendons, usually due to over training. A simple test for tendonitis is to draw your toes up towards you while resisting the movement with your hand. If this exercise creates pain on top of the foot, you may have tendonitis. Pain: Tendonitis occurs over the top of the foot and causes pain when running or at rest. Tendonitis pain is confined to the top of the foot, occasionally spreading to the arch of the foot. The top of foot pain tends to worsen with activity and get better with rest. Swelling & Bruising: There may be some visible swelling and bruising across the top of the foot. Tenderness: The top of the foot is tender to the touch, making it uncomfortable to wear any shoe type. Rest: It usually takes two to three months to recover, but it can take much longer without the proper treatment. Do not return to training until you can run pain-free. Ice: Apply ice compression for 10-15 minutes daily, every two hours. Medication: Non-steroidal anti-inflammatories such as ibuprofen and naproxen are often used to reduce pain and inflammation. Exercises: Strengthening and stretching the calf muscle can help prevent and recover from tendonitis. A tight or weak calf muscle will put more strain on the tendons on the top of the foot. Proper footwear and lacing can reduce the pain on top of the foot and prevent long-term injuries. Runners with high arches are particularly at risk of redeveloping top of foot pain; therefore it is important to buy the proper shoes for your foot type and lace the shoes accordingly. For our recommended best shoes for runners, view our Shoe Review Guide. It is important you are fitted with a running shoe that has an arch support built into the shoe, or you insert an orthotic in a flatter shoe type if you have high arches. Lacing the shoe correctly to prevent the top of foot pain from reoccurring will give you the relief you need to hit the trails sooner. The simplest way to treat and prevent the top of foot pain is to experiment with how you lace your running shoes. Try tying your laces at the side or miss the eyeholes over the most painful area. Another lacing technique that helps relieve pressure on top of the foot is the two-laced method. You will need two shoelaces for one shoe when you lace with the two-laced technique. To do the two-laced method, start with one lace at the bottom of the shoe and lace up. 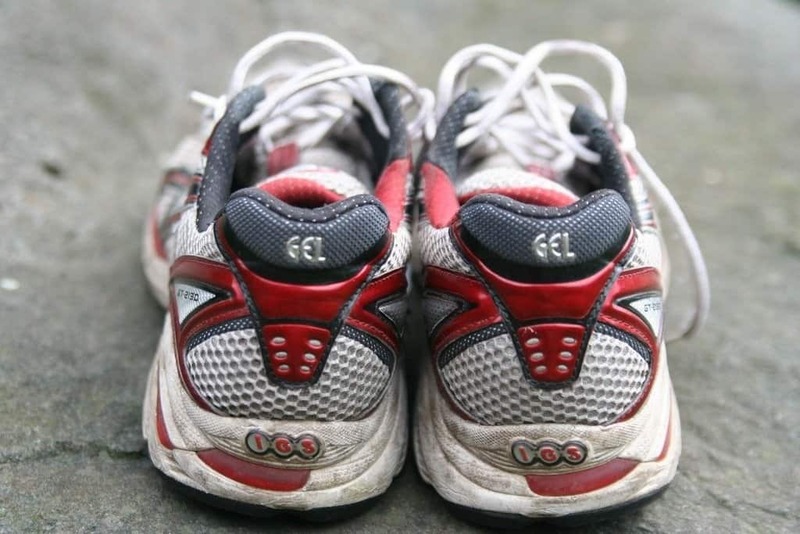 Stop lacing just under the highest part of the forefoot. Take the second lace and skip the eyelet where you experienced top of foot pain. Finish by lacing up to the top of the shoe and tie. 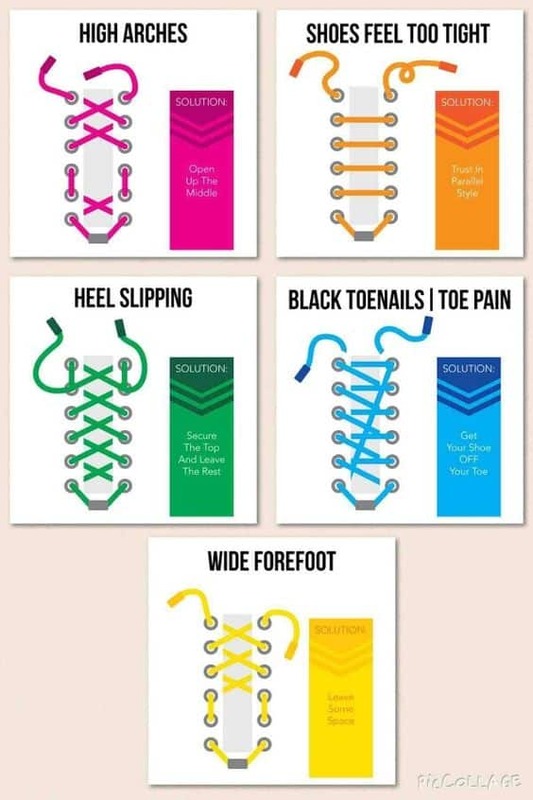 Experiment with these lacing techniques to determine which method is best for your foot. Quick Recovery Tip - If you have top of your foot pain from running, it is best to keep as much weight off your foot as possible, but that does not mean you have to stop running altogether. Move the workouts to the pool. Taking your training to the pool is a great way to stay in shape and to work on your running form. Use a vest that suspends your weight from touching the bottom of the pool and get moving. If you pass this test, do not sign up for your next 5k tomorrow. It is important not to rush back into your training too soon. If it hurts to walk…do not run, if it hurts to run…stop running, and it hurts when resting, see your doctor.